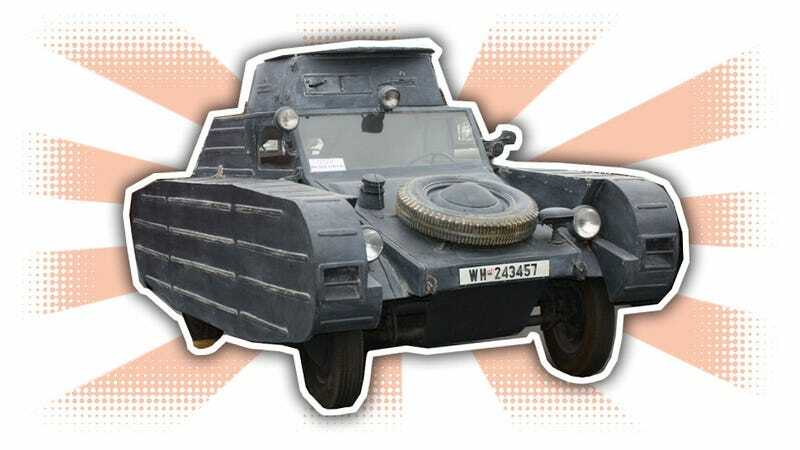 Thanks to this website designed to bankrupt those of us who love cars, I found out that there’s an absurdly rare Volkswagen-derived car for sale on eBay: a Porsche Type 823, which is just the pedant’s name for a wartime VW wearing a tank costume. As everyone likely knows, the first cars Volkswagen started churning out in any real numbers weren’t friendly little insect-like people’s cars, but rather military vehicles based on the mechanicals of the Beetle, and definitely fighting on the Wrong Side. The German counterpart to the Jeep was a car called the Kubelwagen, essentially a Beetle (well, in that era, KdF) chassis with some extra ride height thanks to portal axles and a corrugated, angular body. These were very capable vehicles, and they got repurposed to do all sorts of things, one of which is pretending to be a tank, which brings us to this example for sale on eBay. Porsche (the man and the company) was behind most of the design of the wartime Volkswagen derivatives, which is why this has a Porsche type designation. If you’re curious, Porsche Type 82 was the basic Kubelwagen, so three-digit type codes that start with 82_ are Kubel derivatives. While many assume these were used as dummy tanks to lure bombers away from the real, more expensive tanks, it actually seems that these may have been used for tank training. They don’t drive like tanks do, of course, but I suppose they could have been used to teach drivers tactics and formation driving and all sorts of other tank-ly goodness. Technically, these seem to literally be big metal sections welded or otherwise secured to a stock Kubelwagen. You can see the basic Kubel shape in the front there, with the spare tire and blackout light on the hood. There’s fake track covers on the side, and a fake turret, too. I suppose this may also be one of the very few hardtop Kubelwagens built, as well. The engine should be one of the early 1131cc 25 horsepower flat-fours of the era, but it seems to have been replaced with what looks like a later but still pre-1961 VW flat-four. Visually, you can barely tell. I’m surprised how roomy the interior is. There’s a driver’s seat and a lot of space, and there’s also a swiveling captain’s chair! I also like that it’s still got semaphore indicators, because even if you’re pretending to be a tank, you can still indicate your turns in style. I can’t imagine there’s more than a handful of these left in the world. I do feel sort of conflicted thinking it’s cool, what with all that, you know, Nazi-ism, but just as a mechanical relic, it’s fascinating. Maybe the Lane will buy it and let me drive this crazy thing.